It's really not that hard to get to the top of this pyramid. My personal favorite form of resistance to growing is rational argument. When I’m having a hard time growing with some new development – and every day brings some new development, if we’re paying attention – I will lay out exactly why the world and other people are wrong about that. I’m pretty good at this. I will weave such an adamantine web of logic that all opposition will be as mental midgets in comparison to the brilliance of my critique. And it’s not just me that thinks so. I can always find some others who will agree. “Right on,” they will say as I explain what’s totally unreasonable about what some other person or group has done. Some friends, though, just nod and say, “uh-huh,” and then ask where all this energy of resistance is coming from. These are the friends who serve me better, who help me see past the argument to the fear that drives it. 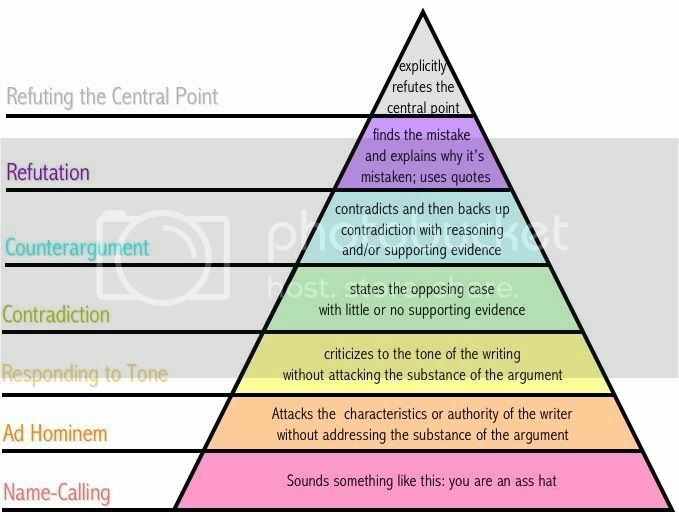 Argument-making is the easy part. I can make arguments for just about any side of any question. As a high school debater, I’d defend the affirmative side one round, and a few minutes later the negative side in the next round, as easily as putting now the left foot forward and now the right foot. In college I studied philosophy. My favorite teacher and philosopher once defined a philosopher as someone who can make the best possible argument for any position no matter how wrong-headed. I think argument is fairly easy for most of us even if we don’t have formal credentials in it. The harder part is the inner work, the self-understanding. “Reason is and ought only to be the slave of the passions,” said David Hume. And one of the things that my reason does in its diligent service to my emotions, is distract me from investigating those emotions -- since actually looking at my stuff will weaken the hold those emotions have on me. Looking at my stuff -- is what growing looks like. Other people help me do that. We come together in faith community to be people who help each other grow. Look around you at church (or synagogue or temple or fellowship . . .) on Sunday morning (or Friday evening, or . . .) That's what growing looks like. This is part 5 of 6 of "What Growing Looks Like"
Next: Part 6: "How Do You Want to Grow?" Previous: Part 4: "Only Way Out is Through"